What is "Restore Andrea" about? This campaign is about restoring an antique Steinway piano. Very simply, it's about retoring a work of art, a piece of music history, a piece of Steinway history, a piece of American history. Who crafted Andrea The Piano? Andrea The Piano is an American made instrument, crafted by Steinway & Sons. The Steinway company first gained infamy as master piano builders with the Square Grand piano, like Andrea. When was Andrea The Piano crafted? This piano is dated at 1872. She predates cars and airplanes. She has traveled by horse & wagon on more than one occasion. What makes Andrea The Piano so special? This piano is made of Brazilian Rosewood, which is endangered. Import & export of rosewood is prohibited from most countries in the world, including the United States. As such, she is an American made beauty that will never leave the U.S.A. This piano is hand carved and features hand stenciling inside. So, she's not just a piano. She is a work of art. While we have no documented proof, we firmly believe Henry Steinway chose the wood for Andrea. You can read here why we think this is the case. This piano is 143 years old. We think that makes her pretty special. But even more, antique experts and piano specialists have confirmed Andrea The Piano as something to be treasured. Where is Andrea The Piano? Andrea The Piano is in a little house, which is actually a piano and music studio, in the beautiful city of Wyandotte, MI. She actually shares studio space with two artists, one whose work is featured in River's Edge Gallery. Who uses/plays Andrea The Piano? Obviously, we, her caretakers, enjoy Andrea The Piano. Young piano students also are given the opportunity to play Andrea. Piano students also learn about piano history, music history. . .and even a little bit of American history with Andrea The Piano. Can I come see Andrea The Piano? We welcome visitors for Andrea The Piano. Just message us and we’ll set up a day and time for your visit. What will Andrea The Piano look and sound like once restored? She will look and sound something like this . Please note the piano in this video is a Knabe and Andrea is a Steinway. And the piano in the video is an Empire style while Andrea The Piano is Rococco, but we think you'll get the idea of the possibilities for Andrea The Piano. Once the necessary funds are raised, we will formally make the arrangements to send Andrea The Piano off for her restoration. The complete restoration process will take one full year to complete. 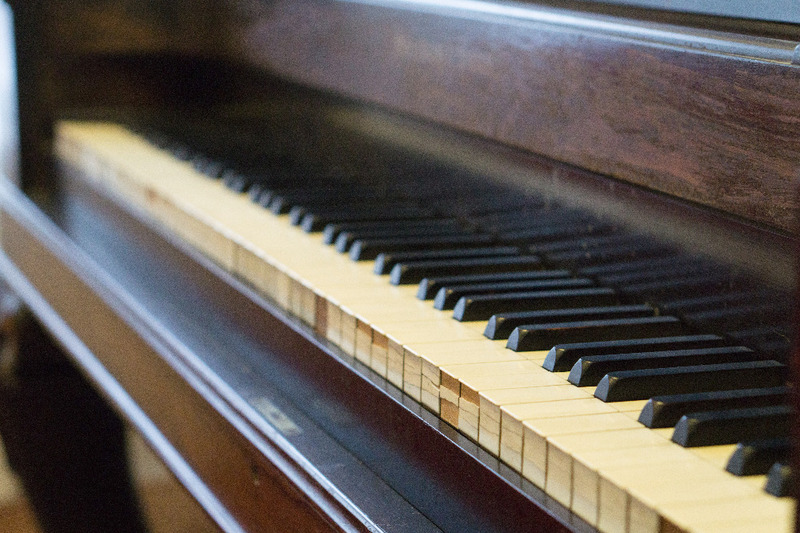 Who will restore Andrea The Piano? We have plans of sending this piano to The Antique Piano Shop in the state of Tennessee. We've done the research and they are really the only place in the United States that can do ALL of the work that is needed. We have been in contact with the owner of this shop and he seems genuinely excited about getting Andrea The Piano into his shop. There are some places in Michigan that can do some of the work. However, moving this piano in and out of the Little House several times does not sit well with us as in the best interest of this antique piano. In the end, all of the restoration work needed cannot be done in the state of Michigan. As you go through The Antique Piano Shop website, you'll see the section on Square Grand Piano Restoration. We hope for the Grade II restoration. How much will restoration work Cost? You can read the full list of work that will be done here. This will include restoration/repair and refinishing of all the wood. This will include the player piano action. This will also include all repair/restoration/replacement of the inner mechanisms of the piano. This also includes the cost for moving Andrea The Piano to and from The Little House as well as a Victorian period piano stool. How much of total costs are we, the owners and caretakers of Andrea The Piano, prepared to pay toward restoration? We do have some money tucked away for the restoration project. However, as many are aware, running a crowd fund campaign such as this one is not cost free. The crowd fund platform does charge a percentage. We specifically chose GoFundMe because the percentage charged is considerably less than any of the other platforms we have investigated. That being said, if we are able to raise the entire amount needed to restore Andrea The Piano, the fees for using this platform will be $2,544.00 At this point, we are prepared to pay all of the crowd funding fees, which means your gift to Andrea The Piano will go 100% toward restoration. 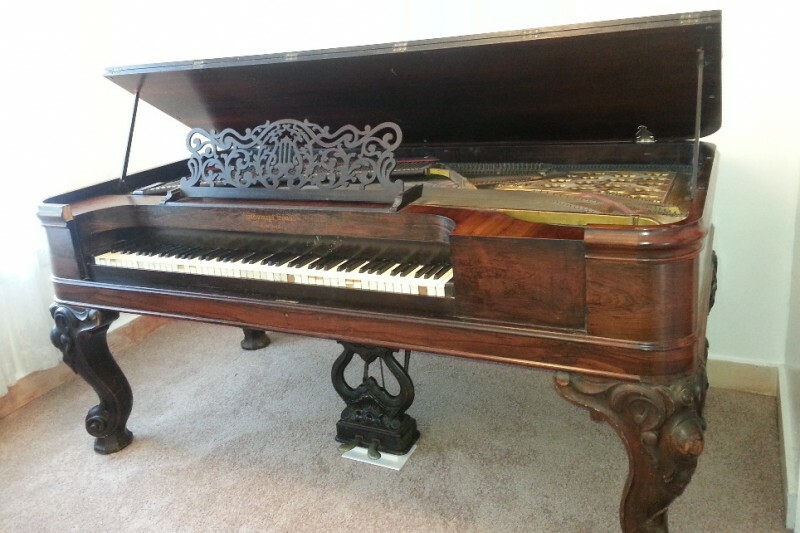 We have also recently saved a few pennies and have added $2,500.00 toward Andrea The Piano's Restoration. And so, the total that we, ourselves, have put into this project is $5,044.00. We are doing other things, like The Shop With Andrea pages, to raise funds. As we raise more funds we will add them here to our total to keep everyone aware of how much money is raised, whether by your generosity or our own efforts. Thus far, the Shop With Andrea pages have added a total $306.00 in funding. What if I can't donate at this time, is there something else I can do to help? Yes! You can share this link (RestoreAndrea.org) on your facebook, twitter, linkedin, etc. You can post on your blog or website. Message me and I'll give you the code for a widget you can use. Offline, we'd appreciate word of mouth support, and even posting of flyers on community bulletin boards. Message me and we'll email/snail mail flyers out to you. My name is Rubi Martinez-Bernat. I’ve been involved in music and music ministry since forever. I’ve served in many Detroit/Downriver churches: St. Francis Xavier (St. Andre Bessette) , Ste. Anne de Detroit, St. Elizabeth, St. Alfred. I’m currently the music director at St. Gabriel. You'll also find me at Detroit’s Sacred Heart Major Seminary, directing the Spanish language choir comprised of seminarians. The Spanish mass at The Seminary is on Friday mornings. I’m a piano instructor. I’ve taught at two Detroit performing arts schools: COMPAS - Center of Music & Performing Arts and Garage Cultural. I currently teach from The Little Piano House, where Andrea The Piano is housed. I've directed adult choirs, children's choirs, women's choirs. I teach piano. Over the years I'm certain that I have served as a musician for well over 600 funerals, and probably just as many weddings. I've been the musical leadership for First Communions, Confirmations, Quinceaneras and more. I've taken choirs and musical groups to Chicago, Alburque and even Mexico City. Has Andrea The Piano been in the Newspaper? Had Radio taken an interest in Andrea the Piano? Yes. WWFM, a classical music radio station in the New York/New Jersey area recently interviewed Andrea's caretaker. You can hear the interview here, but be sure to scroll to about the middle of the file as there is another interview first. And so, I ask you all now. . . .
Won't you please help us restore Andrea The Piano? Maybe it’s because you have a love for music. Maybe it’s because you treasure antiques. Maybe it’s because you appreciate works of art. and would love to help in a local project. have enjoyed her wit, humor, and wisdom. It's a Piano Petting Zoo! If you have not yet met Andrea The Piano in person you will be able to do so on July 16th! We have plans of moving several instruments outside (weather permitting) and inviting the community to come try them out! We even hope to have a "Big" keyboard (hint: think of Tom Hanks!) for this event! Andrea The Piano will remain indoors but you are more than welcome to come inside and behold this antique treasure. 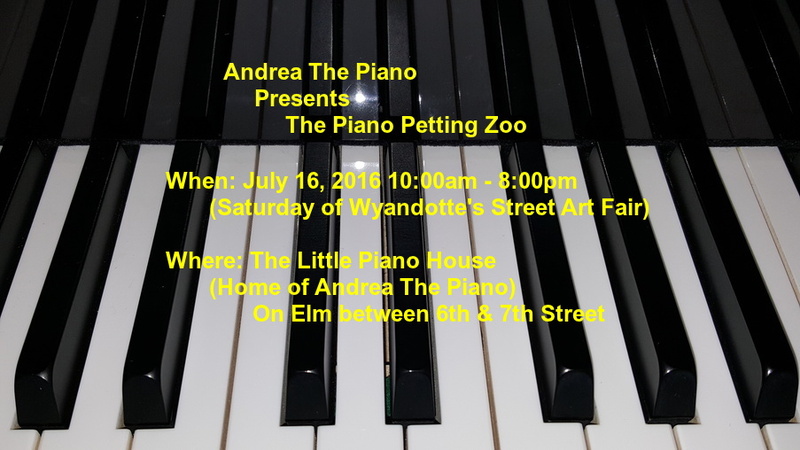 The Piano Petting Zoo is July 16th (Saturday of Wyandotte's Art Fair) from 10:00a.m. - 8:00p.m. The event is on Elm Street between 6th & 7th street. Just follow the piano music! All are welcome! Just a little note to thank our recent donors and to let you know that we are still here! We are determined and will continue to do what we can, online and offline, to raise funds to restore this magnificent antique Steinway piano. We appreciate the donations you have made so far. We appreciate that you’ve shared the link to this page. You’re the best! Santa, himself, has taken time from his busy schedule to offer this video. We appreciate all of the donations so far. We appreciate all of the sharing on social media sites. Please, won't you consider making a donation this holiday season to restore this antique Steinway Square Grand Piano? If 1,000 people donate $25 we'd bite the bullet somehow for the rest of the funds and send her! This video shows what Andrea The Piano might look and sound like once fully restored. I know I've posted this video to my facebook before, but it is so worthy of posting here. The piano in this video was restored by the very people we hope will restore Andrea The Piano for us. Many, many thanks to those of you who have shared funds with us, shared our link and/or have done some in kind donation. We so appreciate it more than words can say. oh, the possibilities. . .
What a beauty! Please support Andrea and allow her to be restored back to her healthy beautiful self. Won't you please help Andrea get back to her former self? She is beautiful and needs some love. Help Ms. Rubi continue being an inspiration through her music by helping restore Andreathe piano! It only takes a little by each of us to collectively help a lot! This project to restore this beautiful piano, Andrea, has greatly motivated us but to accomplish this is truly a challenge that will involve all of us who love music. Helps to realize the dream that is this project. El proyecto de rejuvenecer un hermoso piano, ANDREA, nos ha animado muchísimo pero lograrlo será realmente un reto que involucra a todos los que amamos la música. Ayúdanos a REALizar el sueño de ese proyecto. I can't wait to see this restored! Just over 1G raised at Piano Palooza! Many thanks to all you stopped by and made a purchase or donation. Special thanks to Mariachi Femenil of Detroit!